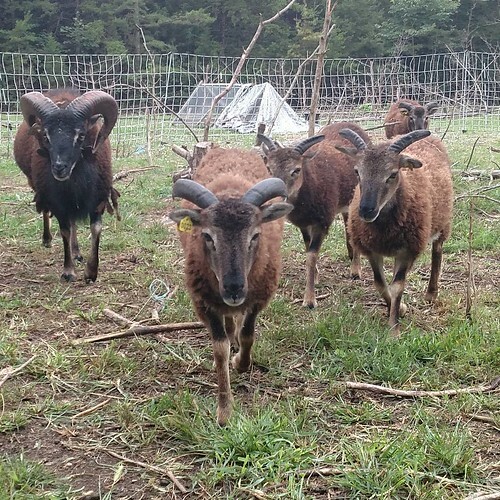 Home / Livestock / How smart are sheep? When I asked on Twitter for my followers to inspire today’s blog post, two people almost immediately wanted to know: are sheep as stupid as people think they are? It’s a little bit of a complicated question. The short answer is no, sheep are in their own way bright and curious creatures, if flighty as hell compared to goats. Sheep can be trained, and while a flock is at first glance a mindless mob, there’s actually some really interesting social dynamics going on. But they’re not, y’know, geniuses. Let me demonstrate with an anecdote. Periodically when we’re moving fences, a couple Soays escape. We’ve set up a sheep trap consisting of a 4 foot tall puppy exercise pen with a dish of grain in it and a long string attached to the door so it can be closed from a distance. Inevitably (and quite quickly now that they know about the grain) if I sit quietly on the milk stand, the escaped sheep will walk right into the sheep trap and I will pull the door gently shut behind them. This trick wouldn’t work on goats. A goat would remember where the door is and charge it, and given that I’m holding it shut with tension on a long rope cobbled together from pieces of baling twine, the goat would escape. The sheep, however, totally forget where the door was and spin in confused circles, so we latch the door, lean over and grab the sheep, and take them back to the flock. It works every time, and in fact the more it happens the easier it gets, because the escaped sheep beeline for the trap and its dish of grain. Supposing I did manage to trap a goat, they’d never set foot in that pen again. Goats have great memories and hold a grudge; sheep brains seem to be easily short-circuited by a pan of sweet feed. 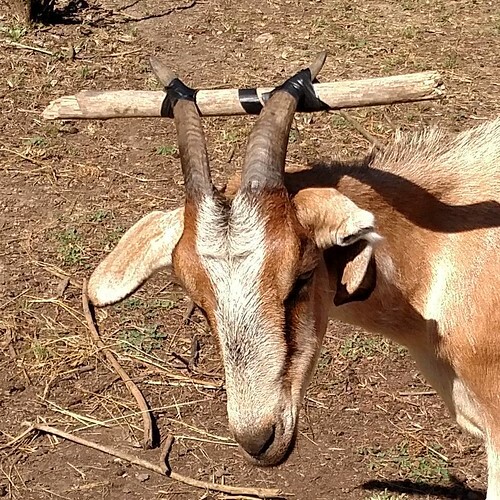 At the same time, none of the Soays have ever gotten their horns caught in the hay feeder, whereas any goat that can get their horns through it will, and then will forget how to get their horns back out, leading to us taping a Stick of Shame to them to prevent them getting trapped. So the question of sheep intellect isn’t as straightforward as it might seem. Certainly they are smarter than people think they are, but a really bright sheep still isn’t all that smart. But they are curious, gentle creatures, and a pleasure to keep.